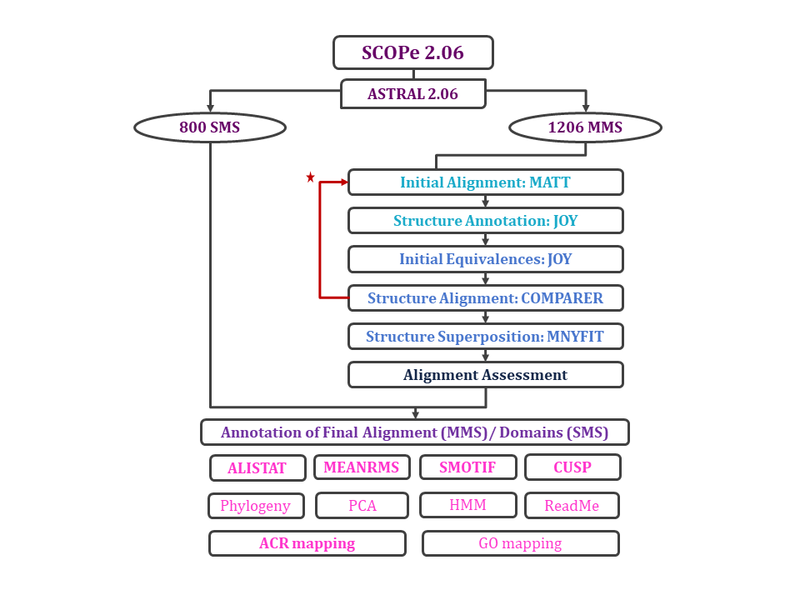 PASS2 is an automatic version of the original superfamily alignment database, CAMPASS (CAMbridge database of Protein Alignments organised as Structural Superfamilies, Sowdhamini et al., 1998). PASS2 contains alignments of protein structures at the superfamily level and is in direct correspondence with SCOPe 2.06 release (Structural Classification Of Proteins, Murzin et al.,1995). The superfamilies are named after their codes in SCOP database: for example, 46548 refers to 'alpha-helical ferredoxin' superfamily.The superfamilies are chosen from SCOP and all the representative members are extracted by using cut-off of 40% sequence identity and good resolution. For all Multi Member Superfamilies the alignment of family members is based on the conservation of structural features like solvent accessibility, hydrogen bonding and the presence of secondary structures. We have employed COMPARER (Sali et al., 1990; Sali et al.,1992) to obtain the multiple sequence alignment of distantly related proteins. The final alignment of multi Member Superfamilies and Single Member Superfamilies are presented in JOY format (Mizuguchi et al., 1998) to display three-dimensional (3D) structural information in a sequence alignment, which helps to understand the conservation of amino acids in their specific local environment. Team: Pritha Ghosh, Teerna Bhattacharyya & Oommen K. Mathew.